After the Norman Conquest, Saint Wulfstan, the Bishop of Worcester, encouraged a hermit named Aldwyn to establish a monastery in what was then the wilderness of Malvern Chase. A monk named Werstan had previously come to Malvern to establish a religious cell during the reign of Edward the Confessor but had met an untimely death at the hands of the Celts. According to the Worcester Monastic Annals the restablishment of the religious cell began in 1085. The Priory was built for thirty monks on land belonging to Westminster Abbey. A charter from Henry I in 1128 AD refers to Great Malvern Priory as 'the Priory of St. Mary'. Westminster Abbey subsequently obtained a Papal bull from Pope Adrian IV which confirms a strong dependency of the priory of St Mary, Malvern, on the Abbey of Westminster. There is an account of the foundation of the monastery in Bishop Guilford's Register of 1283. It describes how hermit Aldwyn petitioned Urse d'Abetot, the Earl of Gloucester, for the original site (of the Priory) in the wood, and land "as far as Baldeyate"; that he collected monks, and adopted the Rule of St. Benedict; dedicating the monastery to the Virgin Mary - but occasionally under patronage of both St. Mary & St. Michael. On the Dissolution of the Monasteries in 1541, local people bought the building for 20 pounds to replace their decaying parish church. This resulted in much of the medieval interior, windows and roof remaining unlike religious establishments elsewhere which were reduced to a ruin. The present building dates from 1085, with mainly 15th century structure, floor, and wall tiles. The original Norman architecture church was extended in the years between 1450 and 1500. The great square central tower is very similar to that of the nearby Gloucester Cathedral; it was built by the same masons. It was redesigned in Perpendicular style by Sir Reginald Bray) and has a very plain interior. The chancel is also Perpendicular in style, and contains the monument of John Knotsford (died 1589), a participant in the dissolution of the former monastic foundation. It is largely thanks to his patronage that the church, and particularly its medieval glass, survived so well. The fine collection of stained glass ranges from medieval to modern, and includes 15th century and 19th century windows. The north transept window, depicting the Coronation of St. Mary, was a gift from Henry VII in 1501, and another from the Duke of Gloucester, later Richard III. A careful restoration was carried out in 1860 under the direction of Sir George Gilbert Scott, the famous architect, who also designed the roof of the nave in imitation of the medieval original. St Werstan the Martyr and the founding of Malvern. St Werstan or Werstern was a monk who relocated to Malvern from the monastery at Deerhurst in the time of Edward the Confessor. Encouraged by the presence of pure spring water, Werstan chose a rocky ledge in the vicinity of the present day St Ann's Well to found his hermitage. The spring may well have been named after him, St Werstan's Well, with St Ann's Well a much later designation. Here Werstan hoped to live a holy and solitary life as a pioneer of a christain order but was murdered and subsequently honoured as a martyr saint. His legend is recorded in the ancient windows of Malvern Priory but has been erroneously dismissed by some historians as a fabrication. The hermitage thus established in the Malvern Hills before the Norman Conquest was eventually to lead to the creation of a full scale priory. Aldwyn, who had been made a monk at the Cathedral Priory of Worcester by the Bishop, and a companion called Guy, replaced Werstan after his murder. Aldwyn, on the Bishop's advice, gave up his contemplated pilgrimage to Jerusalem to continue the religious order at Malvern. Thus Malvern was founded. Werstan's hermitage was reputed to have survived into the 19th century. Also human bones have been found on the site. Relics of St Werstan were on view in Malvern Priory in the 15th century. This uniquely Malvern saint, the founder of Malvern, now enjoys further recognition through the posthumous endorsement as patron saint of Malvern's famous springs and wells and the St Werstan Award Scheme for enhancing the local water heritage. 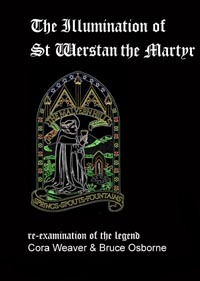 NOW AVAILABLE - The Illumination of St Werstan the Martyr - a detailed study on the legend and authenticity of St Werstan. Now into a second edition (2007), this scholarly work re-examines the legend of the founding of Malvern in the 11th century. It confirms that St Werstan was the original martyr saint who established his hermitage near the present day St Ann's Well. This site was an original mediaeval Holy Well dedicated to this local saint. This published paper puts his life and work into a proper perspective and as such plays an important role in understanding Malvern's history and St Werstan's relevance to the local Springs and Wells. PRICE £9.99 pounds including postage. For details of how to purchase a copy click on the illustration or visit the priory bookshop. 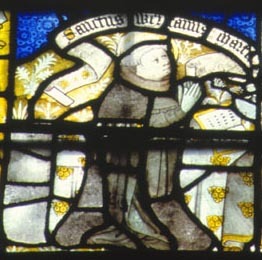 An updated account of St Werstan and his relationship with Malvern, as told in the medieval windows that survive in Great Malvern Priory, can be read in our Newsletter 75. To do this click the newsletter left.